Lonesome Lester Armistead brought the house down when he began an impromptu buck dance recently to entertain the audience at the Arts Center. Jug Band members from left are Mike Armistead, Andy Todd, Leroy Troy and Dan Kelly. 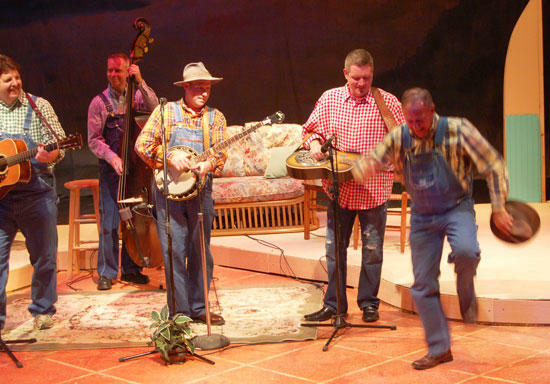 Not one, but a record four times, The Tennessee Mafia Jug Band has filled the nationally-acclaimed Arts Center of Cannon County with fans and laughter. Enter the “Agitator,” from stage left. “That scrub board sounds like the cicadas and that screeching noise we hear outside these days,” judged audience member Ben Northern from Murfreesboro. “The cicadas do sound like a weed eater,” agreed Troy from behind his famous “Tennessee Slicker” grin that’s helped make him into one of country music’s performing comedic icons not seen since the likes of late great Uncle Dave Macon, who operated a mule-hauling business between Woodbury and Murfreesboro before becoming a national star on the Grand Ole Opry when it was spawned back in the 1920s. “We’re five guys and a scrub board with roots in old timey country music like wisdom teeth,” Troy told the packed-out audience. How amusing were the May 27, 2011 antics of Troy and the Jug Band? The song brought the house down with laughter. “But they keep having us back,” Troy defended as his right-hand moved in a clawing blur on his mystical banjo. Murfreesboro’s own Andy Todd and his biggo bass fiddle helped anchor the Jug Band’s record fourth appearance that filled the play house to burgeoning fire marshal code capacity in its’ beautiful Middle Tennessee rolling hills’ setting on the outskirts of pristine Woodbury. “I’m here from Readyville,” confirmed lifelong country music fan Glendon Merritt. History echoed throughout the performance as the Jug Band’s fiddle-playing Dan Kelly rebirthed the soulful style of music played back in the 1930s and 1940s. “Dan played fiddle for years on the Roy Acuff show,” credited Troy.